I am a huge fan of the Shuga series. I watched every single episode from Season 1, so you can imagine my joy when I heard Shuga stars were touring 3 campuses in Nigeria, UNICAL,UNIABJ and UNILAG, and the grand finale was scheduled to take place in UNILAG! 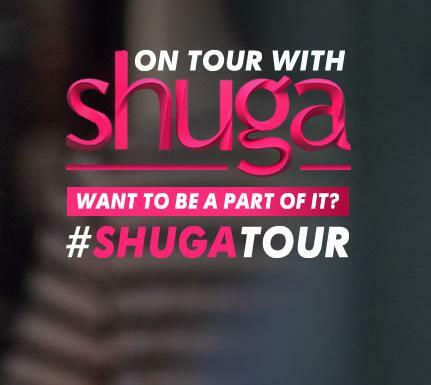 The goal of the Shuga tour was to motivate young people to know their HIV status. The show was free but we had to get tickets from designated spots on campus. My friends got tickets for me and they assured me that it wasn’t a stressful process. The D-day arrived and the venue was the Indoor Sports Hall at the Unilag Sports Centre. The turn out was just okay, but it was understandable as students were about to begin semester examinations. The show was scheduled to start at 4pm but my friends and I arrived at 5pm and I doubt we missed much. 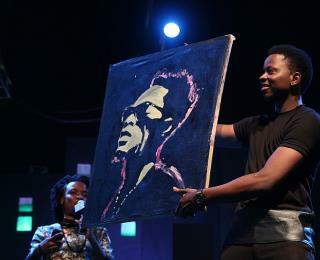 By the time we arrived, Fola David, a medical student of the University of Lagos, had just finished a painting of Patroranking upside down in 4 minutes. Some artistes from the University were also given the opportunity to perform. Apart from the show itself, MTV Shuga organized a Shuga Selfie Competition, Free HIV Counselling and Testing, and even auditions for the MTVShugaAAA Competition, where one lucky person stood the chance of being a red carpet host at the premiere of Shuga season 4. 1. 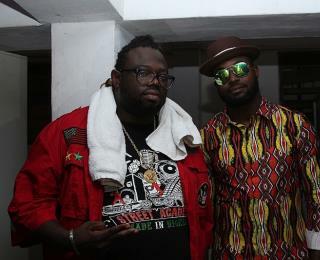 The DJ and VJ: DJ Neptune and DJ Humility were on the wheels of steel and they were on FIRE!! Eiz of MTV Base was the VJ and he did a pretty decent job, and interacted with the audience as much as possible. 2. The Organization: There were several colored tickets and each ticket color determined access areas; Pink for students, Lemon for Invited guests, Blue for Press and Media, Purple for Performing Artistes, and White for Logistics Team, who had access to the entire hall. 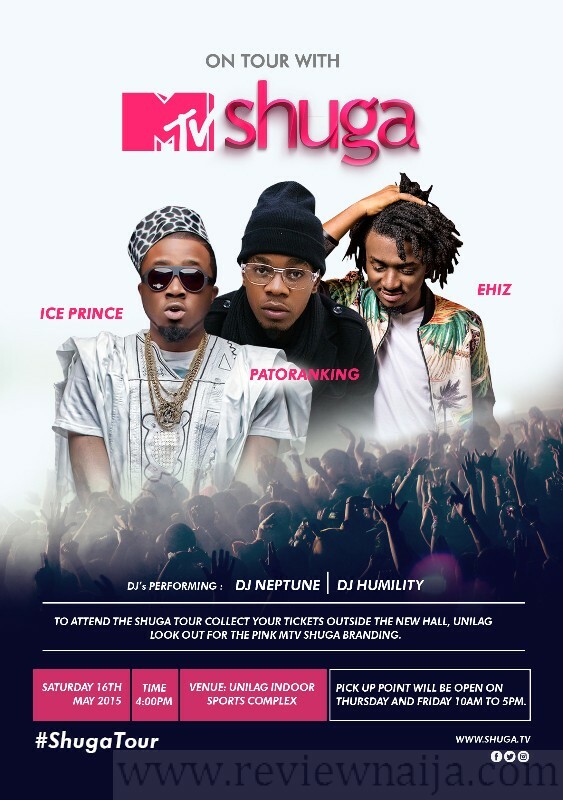 3.The Selection of Artistes: At first, Shuga had stated that only Ice Prince and Patoranking were billed to perform, but we were pleasantly surprised to see Baba Hafusa himself, Reminisce, perform! Reminisce performed hit tracks and crowned his performance with the famous Tesojue. Ice Prince also took us to the past as he performed a bunch of his older tracks including Oleku. Patoranking and his courageous twerkers also wowed the crowd. 4. The Security: There was heightened security at the main entrance which was very impressive . Body guards and UNILAG security men were available. It made admission into the venue fast and orderly. 1. The Seating Arrangement: I was pretty pissed with the seating arrangement. Although the standing section, which is where I was, had the most fun (as stars were throwing their clothing items to the cheering students), I for one would have liked the option to have a seat! 2.The Question and Answer (Q&A) Segment: Shuga cast members, Princess (Sharon Ezeamaka), Tobi (Timini Egbuson) and Femi (Emmanuel Ikugbese), had a Q/A session where students were given the opportunity to ask questions of the cast members. It was very obvious that Emmanuel was the only one interested as the others appeared too proud, or perhaps not in the mood. In conclusion, I wasn’t really impressed with the concert especially in comparison to Coke Studio, which held at the same venue. I would have preferred a vast variety of stars like with the Coke Studio concert, as this would have made the event more lively and possibly pulled more crowd. However, I think the event was successful in that folks who showed up got tested for HIV and became aware of their status and potential next steps. Also, the Shuga stars should have been a little more involved during the Q&A session. I think the lacklustre attitude of the cast members during the Q&A session contributed to making the show quite drab. So my friends at unilag went and complained they didn’t enjoy themselves. Ice prince didn’t kill it for them but they they were glad they got tested.